Heroin doesn’t care who you are, or how much money you have, or why you start taking it. Heroin will take everything from you. Heroin destroys families. Get the facts to prevent heroin abuse. Get help to quit if you are hooked. 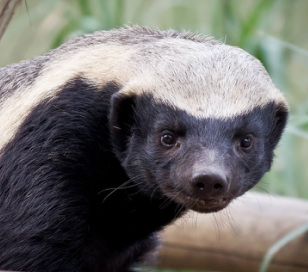 The Honey Badger has a well-deserved reputation for being vicious and relentless. It takes and takes and takes, and "don't care" about consequences. That's what heroin addiction does - it takes away your money, your family, your job, your dignity, your friends, your freedom, and eventually, your life. Heroin is a highly concentrated opiate drug. It stimulates parts of the brain with a powerful jolt, and hijacks the brain into craving more of it. The brain adapts quickly, building a tolerance that requires more and more of the drug to generate the sensation. Heroin also has the effect of causing pain and sickness when it leaves the system. Heroin users start out "chasing the high," need more and more of the drug to get high, and end up using just to "avoiding the sick." It's a miserable, and predictable, pathway. This double punch - the high and the low - is why heroin is such a hard drug to quit. A side effect of heroin - all opiates, really - is the suppression of the "autonomic nervous system" - the part of your brain that does the breathing and heart beating for you. At a certain point, heroin makes your breathing stop, and then you're dead. Another way heroin can kill you is with the other stuff it's mixed with. Taking drugs acquired on the street is especially stupid because you don't know what they are mixed with. Sometimes heroin is mixed with fentanyl, an extra-strong pain killer given to dying cancer patients. People who use heroin laced with fentanyl get dead at an alarming rate. The economics of street drugs can be deadly, too. When supply gets tight, illegal drug suppliers "cut" their drugs with anything and everything - from powdered baby formula to industrial chemicals (what - you thought drug dealers have your best interest at heart?). Users don't get as much drug, so they use more and more doses to get high, and then eventually the supply comes back, and the drug is "cut" less, but users don't know that and they overdose and they get dead. Sometimes heroin kills you right away. Sometimes it takes awhile. In the meantime, heroin addiction will take your money, your job, your family and friends, your self-respect, your freedom and your future. You'll give away anything you have, steal anything you can, do horrible things, to get that next hit. It's better, really, to just not start. DontGetMeStartedOhio.org is a website and organization with tips and resources for building resiliency - the strength and tools to say "no" to prescription drug abuse, which often leads to heroin addiction. DrugFreeActionAlliance.org is another great online resource. Drugs, Brains, and Behavior: The Science of Addiction is an online resource from the National Institute on Drug Abuse, an office of the National Institutes of Health. The section on Preventing Drug Abuse: The Best Strategy is particularly useful, and focuses on adolescence and prevention. "I can quit anytime I want" may be the biggest lie of all when it comes to heroin addiction. Because with heroin addiction, eventually the only thing "you want" is more heroin. Quitting a heroin addiction may take more than just a desire to quit. A number of intensive behavioral- and medication-based treatments are available. To know what mix of treatment options is best for you, you will need a thorough evaluation by a trained medical or behavioral health professional. To get a referral for treatment, contact your doctor, or any of the agencies and programs funded by the Tri-County Board. Have any insurance or Medicaid information when you call. No one is denied services based on inability to pay. If you are in crisis, call the 24-hour Tri-County Crisis Hotline, 800-351-7347. If you or someone you know is already using, the most important thing to do is quit, then begin the recovery journey. No question, quitting is hard. That addiction honey badger will keep coming at you. But keep trying - you can succeed! Recovery is more than just quitting. Recovery is rebuilding the physical, emotional and social damage done, and setting yourself up for long-term success. Recovery means knowing your triggers, and having the tools to overcome them. It takes effort, dedication, and support from family and friends (or sometimes a change of environment). Recovery is a personal journey. That journey will have twists and turns and bumps in the road. With professional help, those bumps can be valuable lessons learned, ways to grow stronger for the next leg of the journey. Getting clean and staying clean are the destinations. What's important is to keep moving, to find the determination and the help to take one more step down the road.